Press and peel is that great blue powdery paper used for printing circuits onto, to transfer onto copper clad board (either with a domestic iron or, in our case, a heavy-duty laminator). 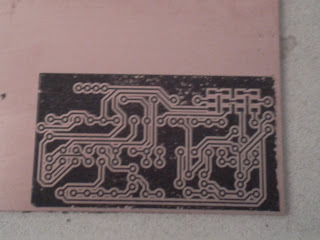 It’s easy to use, creates a sharp, clean image and is a tried-and-tested way of making circuit boards the world over. The only downside is that it’s pretty expensive! At nearly £20 for 5 sheets from Maplin it’s nearly four quid a sheet! 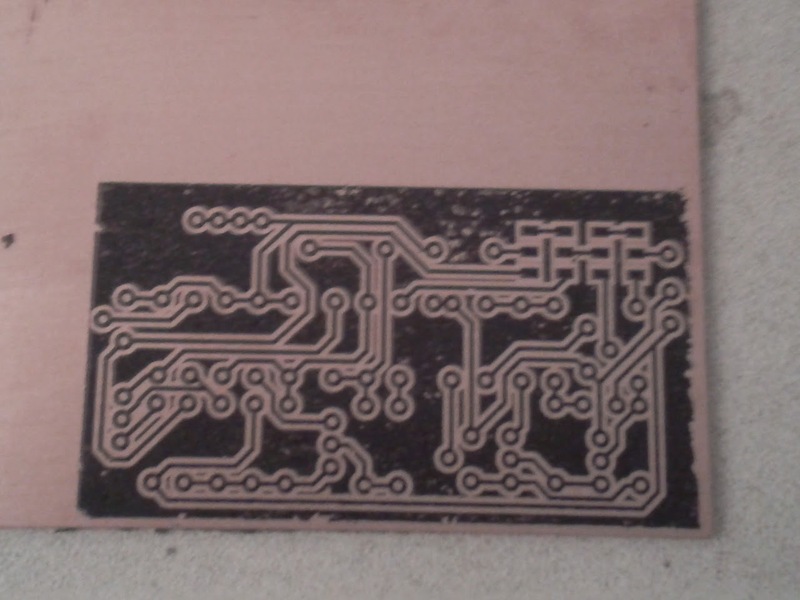 That’s an expensive way to make your own PCB boards – per square inch, it works out nearly twice the cost of the actual copper clad board you’re pressing the design onto! 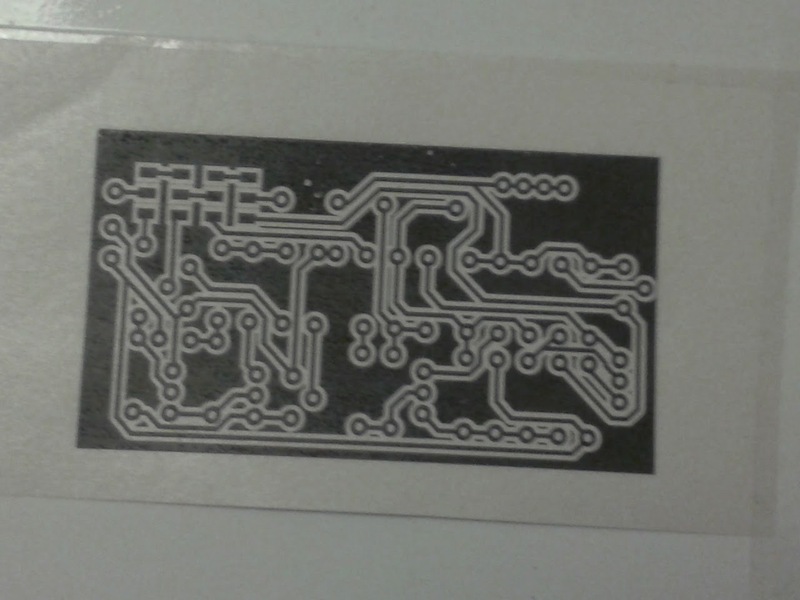 Jason at BuildBrighton recently bought some alternative “toner transfer” paper from eBay. At £15 for 50 sheets (£20 with delivery), it’s much cheaper than “regular” press-n-peel. 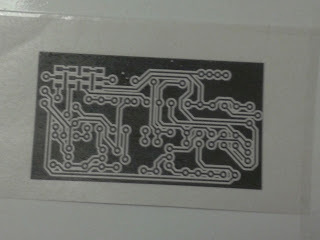 Jason uses a household iron for his toner transfer PCBs and gets pretty good results (we have always found some smudging with an iron ,which is why we use the laminator approach) But Matt has also used the same stuff and hasn’t a good word to say about it! There’s only one thing to do – try it and see! The first thing we noticed is that the image is very delicate to the touch. In places, the black toner is already flaking away. While this is probably good news for the transfer part, it’s not great for making a stable image on the paper. This was printed using the usual settings – a Xerox Phaser 7400 printer with commercial press settings, full black with the fuser set to “thick card stock” (we use 360gsm card as the carrier sheet). The final image was quite stable – rubbing a finger over the copper removed no further flakes of toner – the image looked pretty much the same as it did on the paper before transferring. The flaked parts of the solid plan can easily be filled in with a Sharpie (permanent marker) before etching, but the important thing is that all the traces are solid and there were no immediately obvious trace breaks or blurring which would result in a badly etched board. We’re waiting for our ferric chloride to be delivered following a last-minute eBay order, so we’ll have to etch the board as soon as it arrives, to complete the comparison between this “cheap alternative”. But to date, it looks like it could be a suitable alternative. At almost a tenth of the cost of Press-n-Peel blue from Maplin and nearly a sixth of the price from the cheapest alternative supplier on eBay, we’re really hoping that the final etch is as good as the transferred image! It’s all well and good getting a transfer as good as press-n-peel blue, but it’s the etch resistance that we need to be sure of. Hopefully we’ll have an answer tomorrow…..